Delicious Quick Recipes For Busy Cooks! Inside this cookbook are many easy and quick recipe ideas of all kinds for the busy cook or mom! Save time in the kitchen while making delicious healthy meals, snacks, desserts and more. Many thanks to all the great JAP cooks for their recipes. Thank you for liking it, it has been awhile since I made one. I just need to save up and start buying them and give to friends and family. Hope you are enjoying a good week so far. Hugs. Another wonderful cookbook, Eileen...thanks so much for including me..Hugs! Funny story, Nancy! Well, maybe not so funny at the time. Thank you for including my salad in you wonderful new cookbook. Speaking of beets, another JAPer told me that a kosher deli here in town makes its borscht with tomatoes instead of beets! I thought borscht was always supposed to include beets. Anybody know? I love corn chowder and i will be making this alot for the colder months but will make it too because I like it and can eat this whenever, its a winner! I have been sick and mostly busy with work, drama on the homefront too but its great to be back. I never heard of or had beet chips, thats really different and I love beets. I will share all beet recipes. Im so thrilled to use your recipes in my book, they look so good and I can't wait to try the recipes. Keep your delicious recipes coming! I love them. I have been super busy with work and alot going on at the home front, I have missed everyone here, nice to find some time to get back here, catching up with pinching awesome recipes and making a new cookbook, hope you enjoy it. 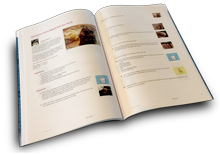 Thank you so much, Eileen, for adding two of my recipes to your awesome cookbook! Eileen... Where you been ??? Missed you. Hope you are well! This is a really nice cookbook. One of the best!! I seen 4 recipes that I will go back, HOT or COLD BEET SOUP (yep!occasionally I goof up) and pinch. P.S Speaking of beets.......Here is a laugh of the day, for you! Eileen, thank you for adding my corn chowder recipe. It certainly is a crowd favorite and is super easy to make! Glad you enjoyed it! Wow, Eileen! This is especially great for summer cooking. Thanks for including my Pimento Cheese Perfection recipe and all of the others. There are several I am anxious to try - and soon!